Three Injured In Rollover Crash on Florida Turnpike Toll Road near North Jog Road | Schuler, Halvorson, Weisser, Zoeller & Overbeck P.A. Two men and a woman were injured in a crash on the Florida Turnpike Toll Road in Palm Beach County, the Florida Highway Patrol said. The crash happened near North Jog Road in West Palm Beach. ‘This is a vehicle crash with injuries,’ said the FHP spokeswoman. The crash happened when a truck towing a van on Florida Turnpike struck a guardrail and rolled over. The tow truck driver and the two occupants in the van that was being towed were the victims, troopers said. 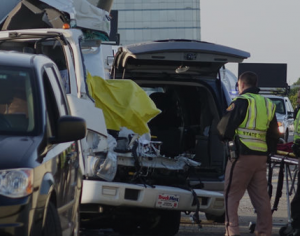 First emergency responders arrived at the site of the crash soon after the accident happened and the victims were transported to the Medical Center for treatment. Two men were taken to the Medical Center with serious injuries, the FHP said. The woman suffered critical injuries and was also taken to the same Medical Center, according to troopers. The cause of the crash is under investigation. Two lanes on the Turnpike are blocked due to the severity of the crash, causing traffic delays. Vehicles on this route are pulling to the roadside to allow crews work. The delay of traffic on this route is due to the severity of the crash. It is best to use an alternative route.